The local weather bulletin posted as of 5 A.M today that Typhoon Ruby has slightly slowed down and gained strength while moving west northwest at 13 kilometers per hour (kph) towards Eastern Visayas. PAGASA weather forecaster Benison Estareja said that the typhoon is now expected to make landfall in the vicinity of Eastern Samar Saturday night or Sunday morning instead of Saturday afternoon, on radio DZMM. Weather bureau PAGASA tweeted as of 8 A.M today that "Typhoon RUBY was located at 450km East of Borongan, Eastern Samar (11.7N, 129.6E)." And today, PAGASA have been raised the public storm warning signals over 34 areas. PAGASA cleared the issues that even Typhoon Ruby has gaining strength, its still not yet reached the strength of Super Typhoon Yolanda. Benison Estareja said, "Ang naging lakas ni Yolanda, 235 kph at 275 kph gustiness." 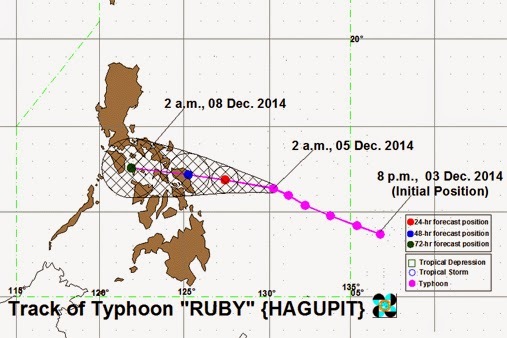 Typhoon Ruby was affected by a low pressure area in east of Japan and the northeast monsoon. Comments or suggestions about "PAGASA: Bagyong Ruby Update for Dec. 5, Friday " is important to us, you may share it by using the comment box below.